Watching your kids improve every year is awesome- not having to purchase new equipment every year is even better! 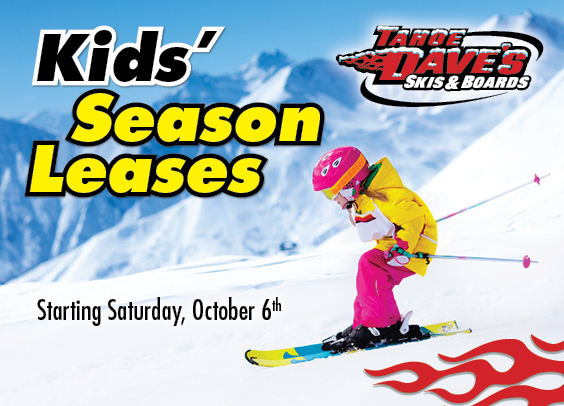 Come to any one of our four Tahoe Dave’s locations and get your kids set up for the entire season for one low price. The contract officially goes through April 30th. If the season runs longer, you can keep your gear as long as the lifts are spinning. A season lease is less expensive than buying for your growing children. A season lease can be much less than renting daily depending upon how many times you use them per season. No rental lines – it’s yours to keep for the season! You can exchange like equipment throughout the season, as your children grow, no extra charge! You can exchange up for a higher level of equipment as your kids improve throughout the season and only pay the difference between the gear you are returning and the gear you are renting. Come in before mid December and pick up your children’s equipment and save $35 on your season lease package. Each package is completely customizable for every price point in between to fit your budget and your needs. *Prices include basic equipment and are based on size and availability. Numerous upgrades are available! *Come in before December 8th and get an early season discount of $35.00 OFF! •Children MUST be present for a proper fitting! Need more information? We’d love to answer any of your questions! Call us at (530) 583-6415 or e-mail info@tahoedaves.com!